Every sweetheart will love this gift! “Thank you for being part of my life’s journey” are the words imprinted on the scroll wrapped in the silver and crystal beaded wire. A recycled glass Lovestone and black faux suede pouch are complemented by the beautiful red poem card. A gift box tied with red ribbon complete the set. 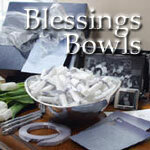 As a romantic or Valentine’s Day gift, the Love Bowl will be treasured for years as an elegant keepsake. For devoted friends, it is a touching way to say thank you for being part of our life’s journey. To a mother or father it is a thoughtful way to share thanks for their years of devotion. 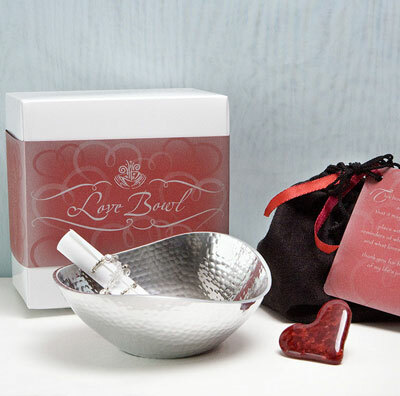 Throughout the year, the Love Bowl is a touching gift idea for a sweetheart, friend, or parent. Inside the texturized metal bowl rests a gorgeous recycled red glass lovestone and a single scroll wrapped with a clear glass-crystal-silver beaded wire. The pre-printed words on the scroll echo the sentiment on the red card, “Thank you for being part of my life’s journey.” The bowl measures approximately 6.5” long by 2.5” high and is packaged in a black faux-suede pouch. Comes ready to give... gift boxed with ribbon!